Trailers, coaches, mobile homes, single-wide, house trailer and the like have all been used to name movable dwellings since the inception of the factory built housing industry. Indeed the first homes were truly a unit that you would pull behind the family car. Measuring 8’ x 32’, it could easily be moved and sited. The villages where these units were placed, either for temporary or long term use, became known as camps or parks. Unfortunately, some became notorious for low grade living as in the “other side of the tracks”. Many of these places earned their reputations. But others thrived and became known for “easy living”. Today there are two main categories of factory built homes that are shipped over the road in one or more sections and erected on a site. Manufactured Homes are built in a factory to the nationally pre-emptive Construction Safety and Standards Act commonly referred to as the HUD Code. Modular Homes are also built in a factory but must be built to the state code in which they will be sited. The level of quality and finishes are set by the manufacturer just like any home builder. There are actually books available that rate the quality of today’s manufacturers like the one written by John Grissim called “The Grissim Rating Guide to Manufactured Homes”. Over the history of manufactured homes, the better communities have created permanence for their residents. As long as rent was paid, rules were followed and homes were maintained, residents and/or their homes could remain in “perpetuity”. This would not only create a desirable and affordable place to live, but would allow the homeowners to build equity like any property owner. This creates the best of both worlds where those who take care of their property are rewarded and obsolete homes can be removed so as not to ruin a neighborhood. This scenario continues to the present in Jensen communities and other stable and well run manufactured housing land lease communities. These communities allow you to buy a home that is both physically and financially manageable. They further allow you to live in your own home and enjoy your home site to garden or play. Most all Manufactured Homes are built on one floor. By their very nature they are more accommodating than older homes with multiple floors and narrower passageways. Customers routinely request changes in specifications to help them live more comfortably in their homes. We are pleased build any feature into a home to make it more accessible and livable for the resident or their guests. These changes typically include ramps to better access the exterior doors to the home, wider doorways to suit their needs, more spacious bathrooms and kitchens, installing select showers or “walk-in” bathtubs, blocking for and affixing grab bars, higher commodes, drive under sinks, lower counters, lever locksets, and numerous other changes as needed by the resident. · Easy Use with no less than one bedroom, a kitchen, some entertainment area, and at least one full bathroom with sufficient maneuvering space… all on the main floor. Jensen communities will be offering EasyLiving Homescm at our Brook Ridge Community in Hooksett NH along with fully assessable homes customized to a buyer’s individual needs. We welcome our customers’ input on how we can make homes that better suit your needs. Are we near the bottom of the real estate market cycle? If we are at the bottom, would you be ready to buy a new or resale home? Without the confidence that the market is at or near the bottom, many buyers have remained on the sidelines or on the fence. They want to buy, see homes that would fit their needs, but are not ready to act for fear of missing the lowest price possible. Some buyers have time to wait, but is waiting at this point in the market really a good idea? 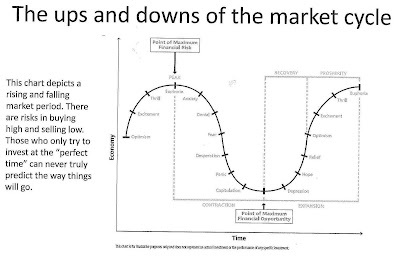 For the same reason that market timing is usually not a good stock market investment strategy (most financial planners would say that “dollar cost averaging” will win out for the average investor in the long run), it is important to understand the emotions most buyers go through in real estate or financial cycles. Our retirement plan investment advisor uses the following chart to illustrate why waiting too long to get back in the market may make you miss out on increases in value. It takes financial security to buy homes or stocks on the way down but buying near the end, through the bottom of the trough, and/or into the recovery period is a great way to buy low with an eye for the best returns. Apparently most people don’t jump back in until the prosperity period starts and they have missed out on the typical appreciation that takes place in recovery. Everyone needs to carefully and conservatively assess their own personal situation. This may be best done with the help of financial and legal advisors. But once you know your financial abilities, consider taking advantage of a buying opportunity of a lifetime.